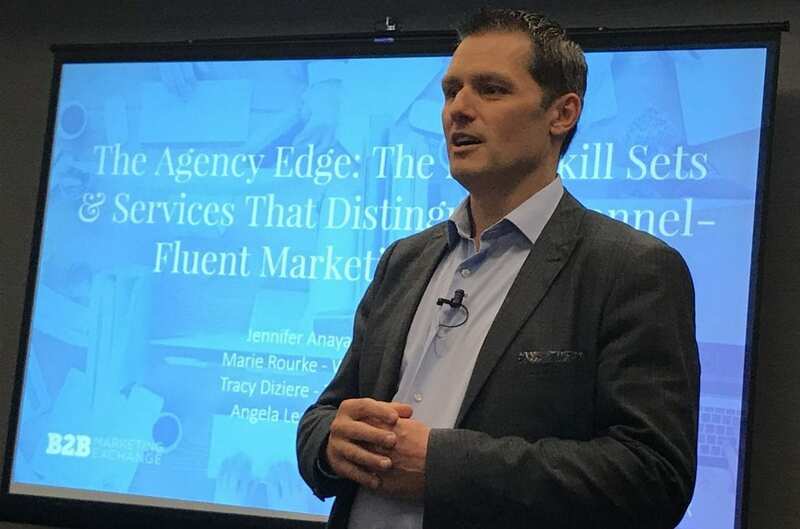 I was honored to be invited to share my perspectives on a “channel panel” (“The Agency Edge: The New Skill Sets & Services That Distinguish Channel-Fluent Marketing Agencies”) at #B2BMX in Scottsdale last week along with amazing professionals like Jennifer Anaya, Marie Rourke, and Angela Leavitt and moderated by Forrester analyst and Canadian (not to be confused with “comedian”) Jay McBain. I’m Tracy Diziere, President and CEO of TDZ Creative Partners. We believe “Nothing is created alone” and that the most productive channel marketers have creative partners — someone to help them bring the best ideas to life. Today, our clients are individuals—mid-level to director mostly— in organizations ranging from billion dollar startups to global Fortune 500 companies and their subsidiaries. Given our focus, the work we do is highly attuned to their individual needs, so our specialty is deep listening and helping them find their paths to being rockstars in their roles. 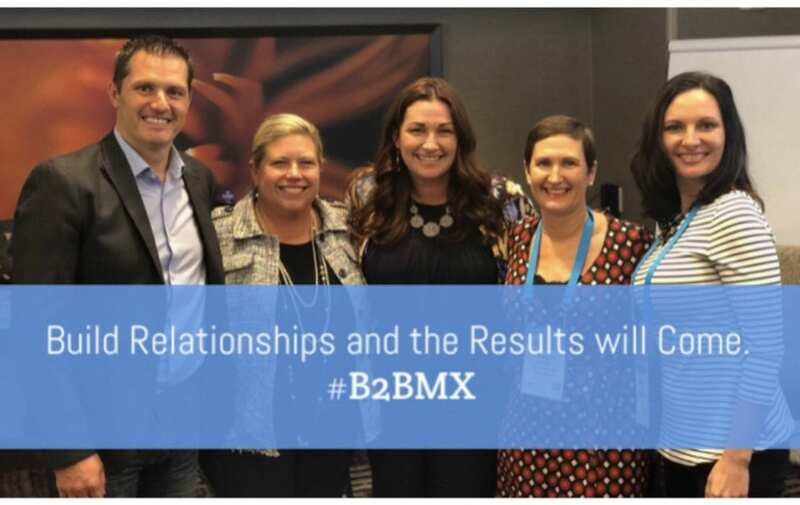 While we create content, support PRM systems, develop sales enablement and partner onboarding materials—as their creative partner, our opportunities are truly limitless. Q: Forrester is predicting a 25% CAGR for channel marketing tools and related services over the next 5 years (making it the fastest growing marketing category overall). Are you seeing this growth? What are customers asking for? A: We see investments to support investments (such as PRM/Channel Enablement tools) and to close the staffing/knowledge gaps. Here are some common scenarios: (1) not having the bandwidth to learn and manage it as well as ensure it’s set up in a meaningful way for partners with all the branding on-point, (2) concerned about keeping it fresh with content and packaging assets appropriately to support launches, and (3) needing more customized attention or aggressive SLAs. Ultimately, our clients need trusted creative partners who are an extension of their teams, who will listen to them, understand them, complement them, and ultimately get IT done–whatever IT is. The requests are relationship-driven and really we have the flexibility to adapt to their needs when they don’t know who else to turn to. Q: While 50% of brands have invested in some type of TCMA – only 17% are satisfied. They are investing heavily in channel marketing tools and services, and yet the adoption / usage rate is less than 20% of their partner bases. What’s causing the lack of engagement from the channel partner and what can companies do to fix it? A: I’m thinking about your presentation earlier when you said, “Co-branding and co-selling is the hardest part.” It doesn’t have to be. It just takes dedication on all sides. Sometimes suppliers and partners/distributors need a liaison in that process. To make it practical we’ve started helping supplier clients and their partners/distributors with their brand or buy pages. 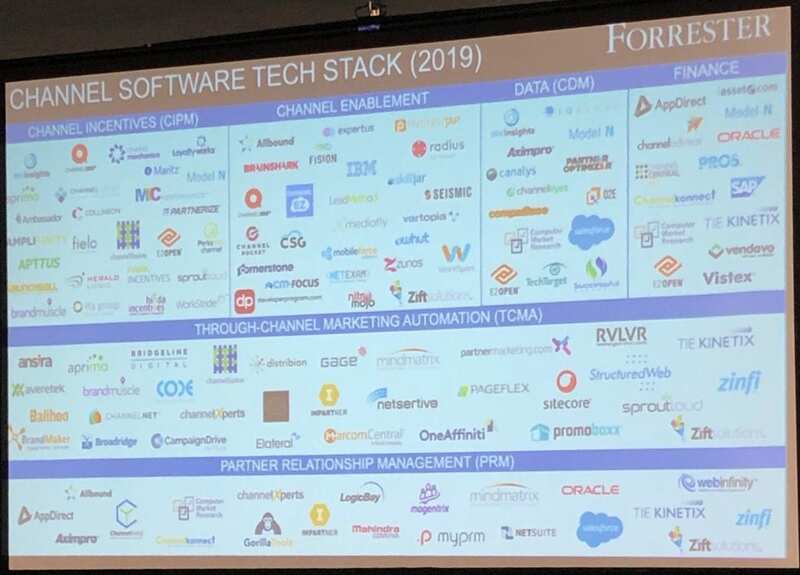 Our focus has been PRM and channel enablement which isn’t “TRUE TCMA” (that wide band in the middle) if you’re following the Forrester Channel Software Tech Stack slide Jay showed during his session. Q: Where’s the money in channel marketing being spent today and why? A: I know it’s a big word: Innovation. If I am an entrepreneurial [that’s what I meant when I said “scrappy”] channel marketer trying to find new ways in a crowded noisy space to stand out, I might be willing to throw a little bit of money at trial and error, innovative things. That’s what some of our clients are hungry for and what they turn to us for. They say, “Hey, I‘ve got this idea, can you help me figure out if this is gonna work and/or how we can play around with this” . . . We work with PEOPLE in billion-dollar startups and global Fortune 500 companies and their subsidiaries. They are individuals . . . trying to make their dollars go farther and faster and some of that has to do with doing new things. And channel enablement and PRM systems because they’ve made an investment and there’s a gap sometimes . . . That’s where they are investing with us. Q: Break down everything you know into practical, action-oriented advice. A: Start having conversations. Almost to the extent of stop marketing and have conversations. Q: There are 105,180 digital agencies. 76% of them are doing technology services now. 75% of the world goes indirectly and channel is a misnomer but this is the last mile for most of the revenue that happens around the world. You don’t control these people, you don’t hire or fire them. They are off doing their own thing and there’s just so many components that make it a challenge. Very few of those 105K do Channel marketing well and for a couple of reasons . . . Closing comments? Don’t worry about trying to figure it all out; no one has it all figured out and quit suffering by comparison or waiting to arrive at the pinnacle of knowledge. It doesn’t exist and it’s more important (and healthy) to enjoy the learning curve. Sometimes it’s like your stomach is in your throat and sometimes you’re on top of the world. It’s the same ride. Breathe. Above all, take care of yourself. Stress causes dis-ease so just remind yourself, “It’s just marketing.” If you’re feeling overwhelmed, reach out for help. Even if you’re not, don’t be ashamed to reach out for help. Quick answers to questions we didn’t cover . . .
Q: What’s the biggest challenge you’re seeing with through-channel marketing programs? A: For context, our focus historically has been on developing the content to support these programs vs. heavy involvement in decision-making around go-to-market. In working with our clients who are making these decisions, what we’ve seen is a move to simplify tiers, structure, and how that gets communicated out. So with deductive reasoning, I would say complexity is the challenge. Our positive impact has really been on the content and sales enablement side and making that information accessible. We are always willing to be an “extra brain” and consult with channel program counterparts, especially in smaller organizations where maybe a handful of people are dedicated to all things channel. Q: What’s missing in today’s channel marketing strategies? A: People remember how you make them feel so emotional intelligence as a strategy would be great! Honestly, I can tell you what we see is authenticity and the human element–so caught up in tools we’re forgetting people are at the heart of this. And innovation. Q: What’s one thing marketers could and should stop doing today? A: Stop trying to do it all themselves, perfectly. Stop having any shame around asking for help. Stop feeling like they have to have it all figured out by themselves.